The following accessories are used with all Transat Automatic Lap Controllers (ALC's). There are two basic accessory configurations; that for a 2-way or 4-way lap machine. A 4-way installation is shown below. The slip ring and 1.8 meter extension cable between ALC and slip ring are omitted in a 2-way installation. 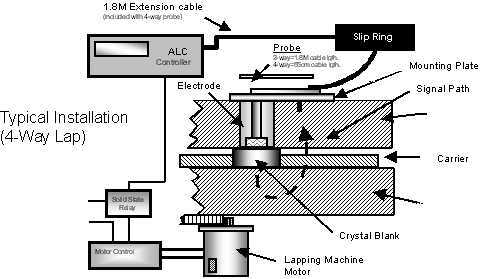 The ALC injects a sweep frequency signal to a quartz blank via a slip ring, probe and electrode. As blanks pass the electrode, the ALC observes resonant responses and terminates the lapping process once target frequency is achieved. A probe is selected based on the frequency range capacity of the ALC and your particular lapping application. The probe assembly contains transmitting and receiving circuitry which connects to the electrode and mounting plate via three banana pins. Probes are made in two standard lengths 0.55m and 1.8 m.
A 0.55m probe is typically used with a slip ring. The probe head (containing probe circuitry) is attached to a 55cm cable. A 1.8 meter extension cable terminated with BNC connectors is attached between the slip ring and the ALC. The one piece 1.8m probe consists of a probe head and cable with BNCs attached directly to the ALC. On 4-way laps a slip ring is required to transfer electrical connection between the rotating lap plate and the stationary ALC. The model SR-20 slip ring is offered with 3 different connector configurations (A, B & C). The model SR-20 slip ring uses mercury wetted contacts for a reliable, low noise signal transfer. The slip ring may be returned to Transat for proper mercury disposal. The electrode is installed through a hole in the lap plate and held in position by a mounting plate. 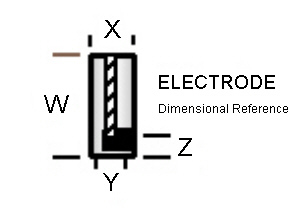 The electrode contains a sensing tip referenced by dimension Y and Z below which carries the ALC signal to the blank. The sensing tip diameter should be 40-80% of the diameter of the crystal blank being lapped. The length of the electrode should approximate the thickness of the lap plate and the thickness of the mounting plate (6.35mm). The mounting plate is fixed to the lapping plate. It securely holds the electrode in place to prevent movement and also delivers a reliable electrical return signal path back to the probe. There are five mounting plate designs to accommodate the various probe diameters. A dual electrode configuration (mounting plate D & E) is recommended for applications with the combined use of a water based slurry with metal carriers. Mounting plate dimensions and electrode compatibility are shown in table above. Please contact factory for part numbering and additional information.